Backflow Prevention Association of Australia president Peter Mclennan outlines everything you need to know if and when you are considering the use of an RPZ. 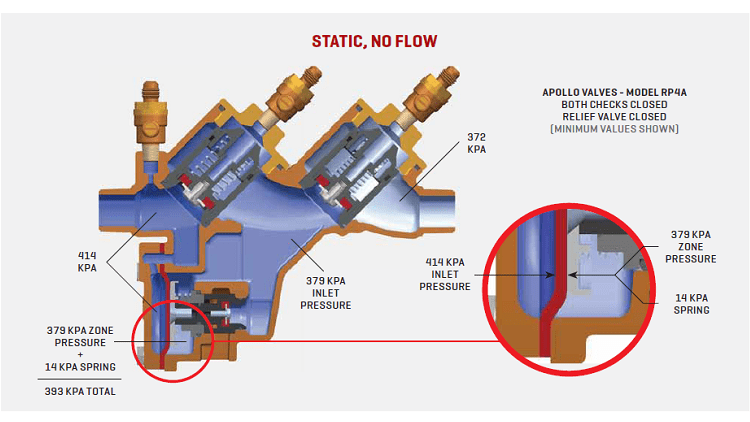 Whether you’re a hydraulic designer, plumbing consultant, contractor or commercial property owner, there are numerous decisions that you must make when considering a backﬂ ow prevention device, in particular a Reduced Pressure Zone Valve (RPZ). An RPZ is a s afety valve that protects a drinking water supply. They are used extensively but many people don’t understand how they operate or the limitations and constraints applicable to these devices. AS/NZS3500.1-2015 is called up in the National Construction Code, Volume 3, the Plumbing Code of Australia. Section 4 is Cross Connection Control and lays out the backﬂow prevention requirements mandated through legislation. When a state or territory calls up the National Construction Code in its plumbing regulations, unless otherwise stipulated, it makes the use of backﬂow preventers mandatory. Backﬂow prevention devices must be WaterMarked to AS/ NZS2845.1-2010 or AS/NZS2845.1-1998. This WaterMark is your assurance that the device has been manufactured and tested in accordance with the relevant Standard. If it does not have a WaterMark it should not be installed. High – The pollutant or contaminant, if ingested, could kill you. Medium – The pollutant or contaminant, if ingested, is unpleasant and may make you ill.
Low – The pollutant or contaminant is non-toxic but is objectionable and should not be present in drinking water. A direct connection. This is where the cross connection is ‘hard piped’ and is often installed by people unaware of the possible consequences. It could be a bypass line or a submerged tank-ﬁlling connection. 2. An indirect connection. The most common cross connection is a hose. A hose is an indirect connection as the outlet can be used and left in myriad conditions. For example, drain cleaning, chemical mixing, pipe ﬂushing, pool ﬁlling, etc. Back siphonage – where the pressure in the supply line is reversed causing the water to be sucked or run backwards. This is usually caused by a water main break in the street but can be caused by mechanical devices that rely on the Venturi eﬀect to draw water from the supply line. Back pressure – where the water pressure within the facility is greater than the supply pressure. Causes can include high head pressure found in high rise buildings and at the top of hills, and mechanical equipment failures. Testable – for use in high hazard applications. Non- testable – for use in low hazard applications. Backﬂow preventers rely on pressure drop across the check valves for eﬀective operation. The minimum spring diﬀerentials are stipulated in the Standard and all watermarked devices must comply. Testable backﬂow preventers are ﬁeld tested for eﬀective operation at least annually by an accredited tester trained in backﬂow prevention. Always check the manufacturer’s published literature for the pressure drop curve to ensure you have enough available pressure to supply the amount of water required. This is especially important where a ﬁ re connection is concerned. 100mm RPZ valve at 20L/s has a head loss of 68kPa. 100mm double check valve at 20L/s has a head loss of 20kPa. 100mm double detector check valve at 20L/s has a head loss of 68kPa. 100mm single check valve detector testable at 20L/s has a head loss of 57kPa. These ﬁgures are for devices only and do not include strainers or isolating valves. These values need to be taken into account where pressure is limited. All RPZ valves will dump water through the vent in the valve. It is a safety feature that ensures that if the device fails or there is a backﬂow event, the drinking water is protected. The spillage of water is often inconvenient, but when an RPZ valve is installed where water cannot get away, it can become dangerous to property and humans. All manufacturers publish the discharge rates applicable to their devices so be aware of these when you install an RPZ; otherwise, you may have a ﬂood on your hands. For example, a 50mm RPZ with a pressure of 700kPa can discharge suﬃcient water to empty an Olympic-size swimming pool in six hours. Backﬂow prevention devices are mechanical devices that require regular testing and maintenance. To facilitate this, they must be installed where ease of access is available. The Standard addresses some aspects, but each manufacturer outlines speciﬁc installation requirements in their published literature. Is the device I am installing suitable for vertical and horizontal installation, or just horizontal? Is the device I am installing suitable for concealing in a valve box or pit? Does the device I am installing have ease of access for regular testing and maintenance without the need for special equipment or dismantling from the line? Concerns surrounding backﬂow are quite serious and should not be easily dismissed. In the next edition of Plumbing Connection, I will continue to look into the issue and oﬀer readers more practical advice on how to prevent a potential disaster.